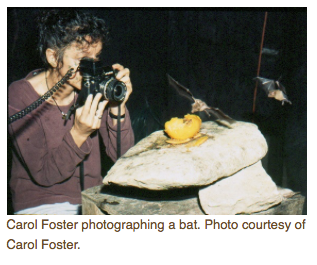 Carol Foster talks about wildlife filmmaking. She tells “The WildLife” host Laurel Neme, how she and her filmmaker husband, Richard Foster, have constructed a special studio in the jungle of Belize that allows them to film wild behavior that would not otherwise be possible. For instance, they’ve captured a baby cantil viper wriggling the green tip of its tail over its head to attract and capture frogs, and also filmed flower mites hitchhiking in the nostrils of a hummingbird.